Josh Wicks makes a save from Invicta's Lucy Gruber. National League ice hockey: Phantoms are clearly not the only Peterborough ice hockey team enjoying a fine season. The table-topping Islanders are also in fine fettle as they proved with a 6-1 home success over Invicta Mustangs to remain in pole position in National League Division Two South (East). 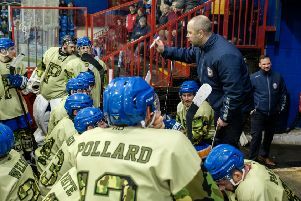 Islanders took command early on at Planet Ice last Saturday with three goals in the space of four-and-a-half minutes from stand-in skipper Shaun Yardley, Jake Samal and Dale Jowett. The second period opened with a goal from Leon Groom, who was later thrown out on a match penalty, but Invicta responded with their only strike of the night as Michael Stokes beat netminder Dan Lane. Man-of-the-match Joe Wilson grabbed his first Islanders goal on a powerplay late in the middle session and Nathan Pollard hit a short-handed sixth inside the final two minutes of the contest when Islanders were actually at a two-man disadvantage. Islanders go to lowly Lee Valley Lions on Saturday (January 31).